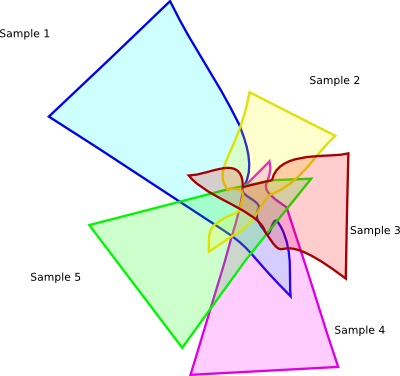 >I was looking for a way to clean up my 5-way Venn diagrams (aka, remove the spaces with zeros) when I discovered you can do some pretty amazing things in Inkscape once you convert your objects to paths. Since I plan to use this as a figure, I’ve removed the relevant numbers, but left the shapes – I think it’s pretty obvious right away how the relationships work, which isn’t bad, considering it IS a 5-way venn diagram. As I mentioned above, the image was made in Inkscape (available for windows/linux/mac). The software natively produces scalable vector graphics, which can be exported to png. Despite the complexity of the image, it really doesn’t take long to do this, and Inkscape is pretty easy, once you get the hang of it. Anyhow, while it’s not immediately clear how to interpret the figure, it’s still an interesting representation of data that would otherwise be totally impossible to interpret with the naked eye. -person2- No, it's absolute. That's why I gave a reference point. -person2- Sarcasm is also absolute. -fejes-   if it were absolute, you wouldn't need a reference point. -fejes-   sarcasm also lacks a good scale. -person2- You're somehow less funny than I am. >I have days where I wonder what language comes out of my mouth, or if I’m actually having conversations with people that make sense to anyone. Due to unusual circumstances (Translation to English: my lunch was forcibly ejected from the fridge at work, which was incompatible with the survival of the glass-based container it was residing in at the time of the incident), I had to go out to get lunch. In the name of getting back to work quickly, as Thursdays are short days for me, I went to Wendy’s. This is a reasonable approximation of the conversation I had with one of the employees. Sometimes I just don’t get fast food joints – they make me wonder if I have aspergers syndrome. After that conversation, I wasn’t even going to touch the issue that my “sprite, no ice” had more ice than sprite. >With IBM tossing it’s hat into the ring of “next-next-generation” sequencing, I’m starting to get lost as to which generation is which. For the moment, I’m sort of lumping things together, while I wait to see how the field plays out. In my mind, first generation is anything that requires chain termination, Second generation is chemical based pyrosequencing, and third generation is single molecule sequencing based on a nano-scale mechanical process. It’s a crude divide, but it seems to have some consistency. At any rate, I decided I’d collect a few videos to illustrate each one. For Sanger, there are a LOT of videos, many of which are quite excellent, but I only wanted one. (Sorry if I didn’t pick yours.) For second and third generation DNA sequencing videos, the selection kind of flattens out, and two of them come from corporate sites, rather than youtube – which seems to be the general consensus repository of technology videos. Personally, I find it interesting to see how each group is selling themselves. You’ll notice some videos press heavily on the technology, while others focus on the workflow. Ok, get out your popcorn. Note: If I’ve missed something, please let me know. I’m happy to add to this post whenever something new comes up. >Why peak calling is painful. The pitfalls, when they do show up, can be very painful – masking the triviality of the situation. On the whole, each of these things is a separate software design issue worthy of a couple of seconds of discussion. When it comes to building software, it’s really easy to fire up a “one-off” script. Anyone can write something that can be tossed aside when they’re done with it – but code re-use and recycling is a skill. (And an important one.) Writing your peak finder to be modular is a lot of work, and a huge amount of time investment is required to keep the modules in good shape as the code grows. A good example of why this is important can be illustrated with file formats. Since the first version of FindPeaks, we’ve transitioned through two versions of Eland output, Maq’s .map format and now on to SAM and BAM (but not excluding BED, GFF, and several other more or less obscure formats). In each case, we’ve been able to simply write a new iterator and plug it into the existing modular infrastructure. In fact, SAM support was added in quite rapidly by Tim with only a few hours of investment. That wouldn’t have been possible without the massive upfront investment in good modularity. The second pitfall is memory consumption – and this is somewhat more technical. When dealing with sequencing reads, you’re faced with a couple of choices: you either sort the reads and then move along the reads one at a time, determining where they land – OR – you can pre-load all the reads, then move along the chromosome. The first model takes very little memory, but requires a significant amount of pre-processing, which I’ll come back to in a moment. The second requires much less cpu time – but is intensely memory thirsty. Moving along to the last pitfall, the one thing that people want out of a peak finder is that it is able to do the latest and greatest methods – and do it ahead of everyone else. That on it’s own is a near impossible task. To keep a peak finder relevant, you not only need to implement what everyone else is doing, but also do things that they’re not. For a group of 30 people, that’s probably not too hard, but for academic peak callers, that can be a challenge – particularly since every use wants something subtly different than the next. So, when people ask how hard it is to write their own peak caller, that’s the answer I give: It’s trivial – but a lot of hard work. It’s rewarding, educational and cool, but it’s a lot of work. >A colleague of mine was working on a nifty tool to give graphs of the base quality at each position in a read using Eland Export files, which could be incorporated into his pipeline. Over a discussion about the length of time it should take to do that analysis, (His script was taking an hour, and I said it should take about a minute to analyze 8M illumina reads…) I ended up saying I’d write my own version to do the analysis, just to show how quickly it could be done. Well, I was wrong about it taking about a minute. It turns out that the file has a lot more than about double the originally quoted 8 million reads (QC, no match and multi match reads were not previously filtered), and the whole file was bzipped, which adds to the processing time. Quite a neat use of piping, really. Anyhow, I’ll include this tool in Findpeaks 4.0.8 in case any one is interested in it. And for the record, this run took 10 minutes, of which about 4 were taken up by bzcat. 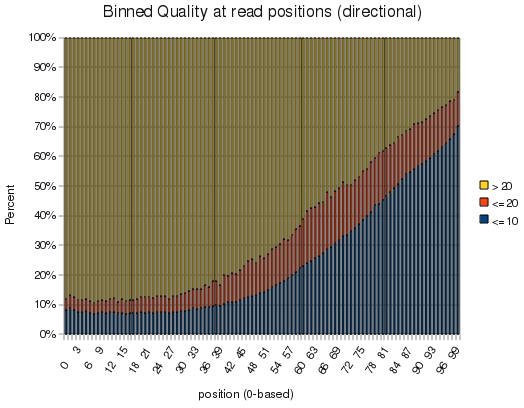 Of the 16.7M reads in the file, only 1.5M were aligned, probably due to the poor quality out beyond 60-70bp.